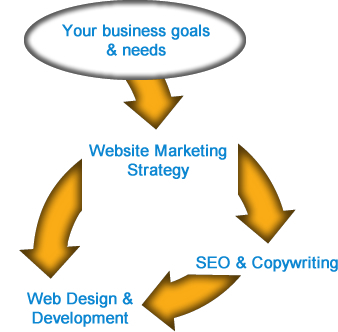 All successful websites require some type of Web marketing strategy. With the changes Google made to its search engine in 2011 and 2012, search engine optimization (SEO), the process of improving the visibility of a website, has greatly changed. 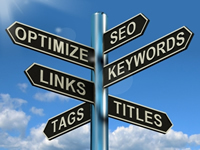 SEO has become more complex, requiring a marketing strategy. Our strategy starts with our consultation with you. Your website must be on page 1 of search engines to be visible. Only 5% of all searchers go to page 2. With our strategy, we can help you target the right audience and knowledge level for each Web page, using various Web marketing services. To be successful, your website not only needs to attract visitors, but also it has to make visitors want to take some type of desired action. Using our expert marketing knowledge, we will build your site to increase your conversion rates. That is why we take an integrated approach to Web design & development. We incorporate it with SEO & copywriting, into an overall marketing strategy to increase your visitors and conversion rates. build a website or redesign that you and your visitors will love. Keyword research starts with analyzing the keywords people type into a search engine. This research is one of the most important and high return on investment activities in search engine marketing. We use keyword research to rank you on the first page of Google, determine domain names, and target the right kind of visitors to your website. Ongoing keyword research is a necessary component of a successful website. It involves finding new keywords to target for each new page and article posted on your website. We do an analysis on your competition to determine their strengths and weaknesses and to understand how your website can compete with your top competitors. We use ethical search engine optimization techniques to make your website more visible to search engines. We can either write your pages or take the content you develop and optimize it for visitors and search engines. Building links from an incoming website to yours and from yours to an incoming website are essential to increase your website's authority on the Internet and get more traffic. We use an effective strategy to building. We can set up social networking pages, like Facebook, integrate social networking buttons into your website site, and provide you with a strategy for success. Email marketing is an effective way to get a ready-made audience. We can help you set up email marketing and provide you with a successful strategy. We can help define an effective plan for using your blog. Also, we can tie your social networking to your blog, saving you time and effort from having to post items in multiple places. We can use pay-per-click advertising to drive traffic to your website. Using Web analytics, we can track important statistics to see how your website is performing. To be effective, Web design and development must contain search engine marketing techniques. Just as direct marketing can test various whether one message is more effective than another, we can use various tools to test various messages on the website to see which ones are more effective. We will be happy to talk with you about a Web marketing strategy to make your website flourish. ©2019 Hulsey Software. All Rights Reserved. All trademarks, content, and copyrights are property of their respective owners. Hulsey Software is a St. Louis Web Design company.